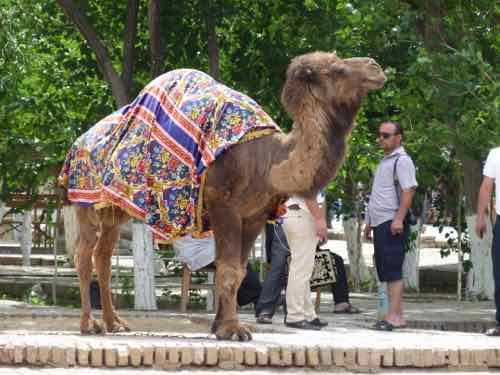 The Silk Road is just that sort of exotic sounding destination that calls to us. Well, it’s not exactly a destination, but a journey. It was an ancient network of trade routes that for centuries connected the Far East to the Mediterranean. Silk, spices, carpets. And peoples' names and whole kingdoms… civilizations that I only vaguely remember learning about in school. Greeks and Alexander The Great. The Mongol Empire and Genghis Khan. Who wouldn’t want to go where Marco Polo went? I’ll just chat about what we experienced… This won't be a comprehensive review of what to see and do... there are whole books for that. Just some highlights here. 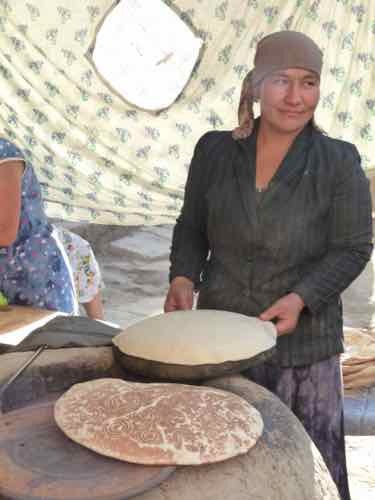 Perhaps enough to pique your curiosity about Central Asia. Every country we visited felt safe. The people were some of the friendliest that we’ve ever encountered. The food was good... And the sights were extraordinary. I want to encourage you if you have an interest because once you decide to go, you will undoubtedly run into objections from some of your friends and family…. “Is it safe?”, they’ll ask. When you tell them you’re going to Central Asia or the Silk Road, they’ll have no idea where in the world you’re talking about. If you mention specific countries, you’ll probably get a blank stare. Ignore them and just go. That’s the tour we took. Just the central part. Let’s go through the 5 Stans… Kyrgyzstan, Kazakhstan, Tajikistan, Uzbekistan, and Turkmenistan. It took me a while to be able to spell Kyrgyzstan. I love that having been there, I know where it is AND how to spell it! You’ll fly into Manas International Airport in Bishkek. That is the capital of Kyrgyzstan. It is a nice city… but all modern. You may be wondering... why Manas International Airport? That’s because Manas is the hero of a traditional poem. ...with a small portion of the poem chanted by a “manaschi” (a specialist in the epic). It’s a poem with nearly half a million verses! 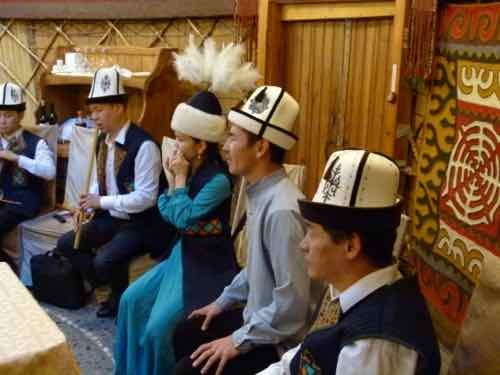 ...And hear traditional instruments played by musicians in colorful historic costumes. But what does that have to do with the Silk Road you ask? Ah… we find that about an hour drive away (80 km or 50 miles). 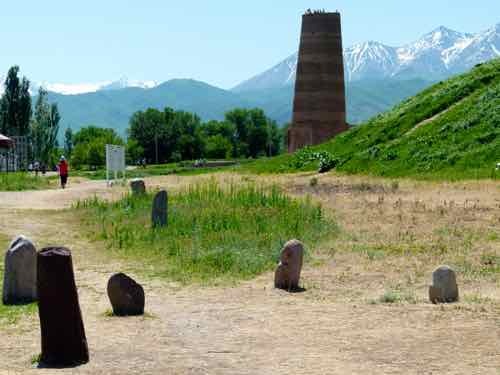 The Burana tower is one of the last remaining watchtowers along the Silk Road. It was built on the ruins of a Soghdian city called Balasagun. There is a museum there with an outside exhibit of “bal-bals” or ancient burial stones. The Kyrgyz people are still fond of their horses. 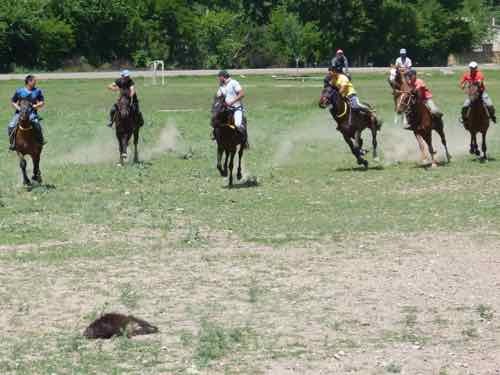 You may be treated to horse games including goat polo. 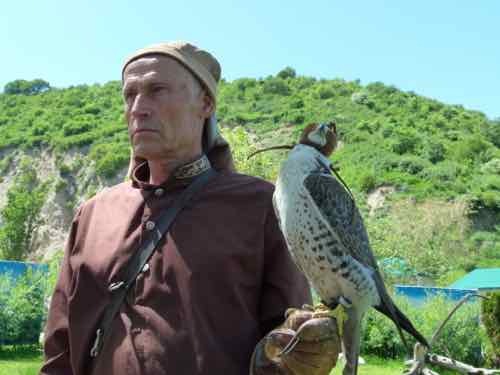 And Kyrgyzstan will prove that it’s not all steppes and desert in this part of the world. The Tian Shan Mountains dominate a large part of the country. Almaty is the capital of Kazakhstan. Another modern city. Bigger and more modern than Bishkek. You can also get a taste of traditions. 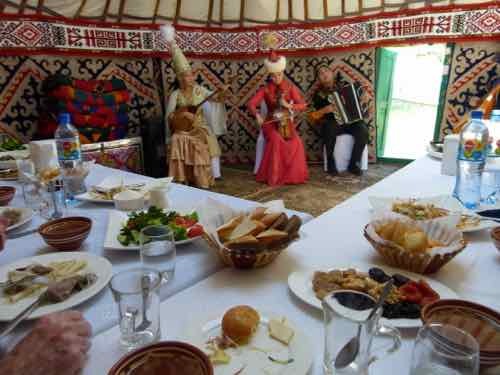 Our tour included lunch in a yurt.. once again with traditional music… and horse meat. Kazakhs value their horses, but they raise some for riding and some for meat. That was a little hard for my western sensibilities. We also were treated to a demonstration of hunting skills by falcons, eagles and a bearded vulture on a falcon farm in the hills outside of town. There are more than 5 Stans of course… We sort of thought that perhaps they only included Tajikistan to round out the 5… but that was not so. 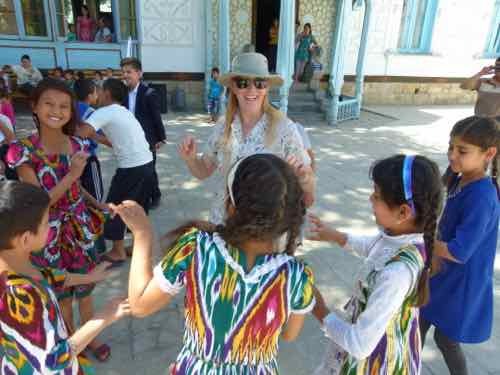 Khujand is not the capital of Tajikistan, but the capital is a new city… and Khujand is an ancient city situated at the entrance to the Fergana Valley. 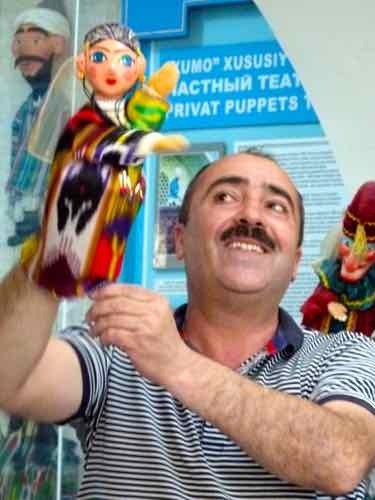 I had heard neither of Khujand nor of the Fergana Valley, but both played integral parts in the history of the Silk Road. 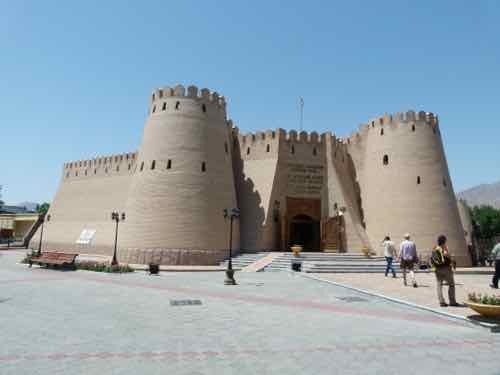 The Historical Museum of Sogdiana is built on the remains of the 10th century Timur Malik Fortress. 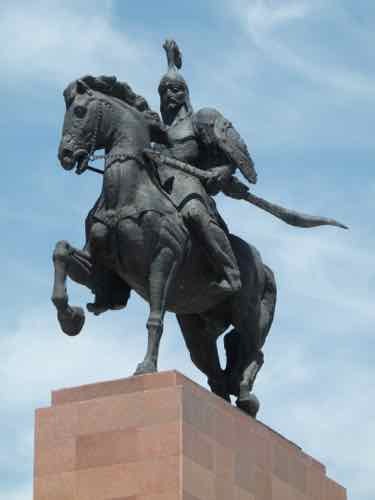 Khujand was once named Alexandria Eschate or “Alexandria the Furthest”… the furthest east Alexander the Great built a city. That definitely makes it an integral part of the 5 Stans! ...but cities did and do. 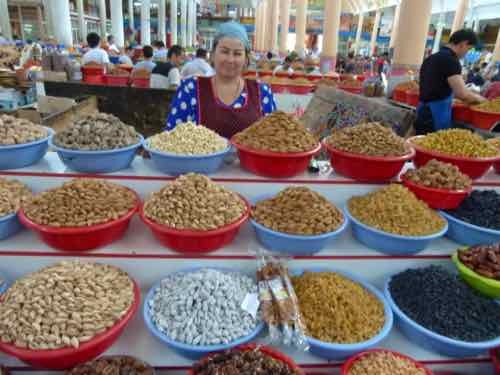 The bazaar in Khujand was just as much fun as any with all kinds of breads, meat, nuts and spices. I gotta tell you, I really wanted to go to all 5 Stans… and I’m so glad we did. We learned so much that way. 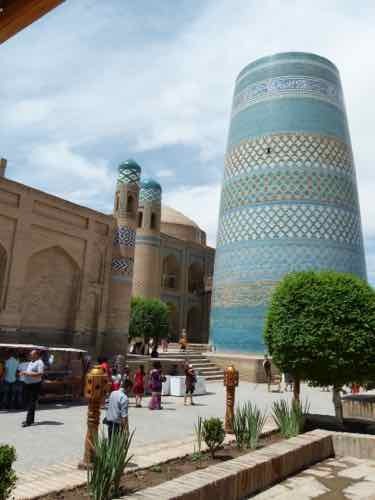 Uzbekistan hosts a dazzling array of Silk Road cities. This is when we really started getting blown away. 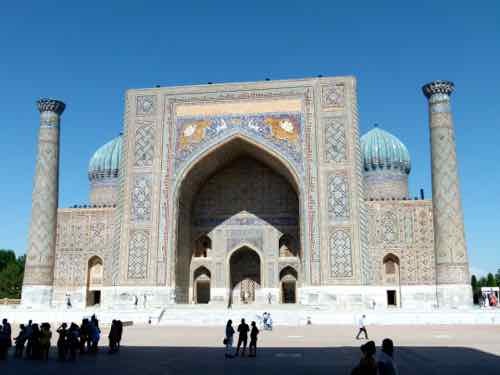 Tashkent, Samarkand, Bukhara, Khiva… now those names conjure up history. 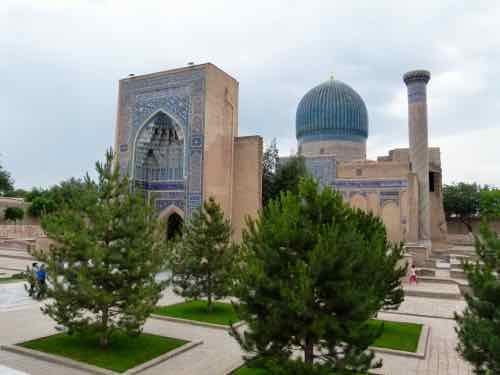 Tashkent was destroyed by an earthquake and is mostly a modern city today… but the history is there. In the library of the Tillya Sheikh Mosque, there is the Uthman Koran… considered by Sunni Muslims to be the oldest Koran in the world. Even modern cities have covered bazaars with meats, bread, spices… and of course silk... I was tempted by those dresses. 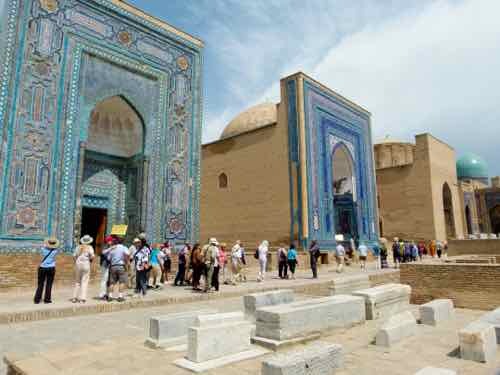 Just the name Samarkand evokes romance and adventure doesn’t it? It ranks right up there with Kathmandu, Marrakesh, Timbuktu, and… well you name it. When we arrived at the entrance to Registan Square, we KNEW we were on the Silk Road. 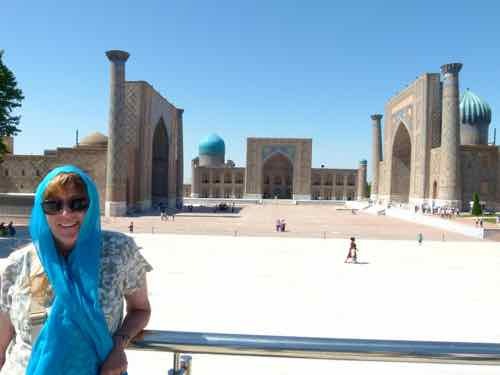 Registan is the centerpiece of Samarkand and probably one of the most recognizable landmarks along the whole Silk Road. Three amazingly tiled madrasas frame the “registran” which means “ place of sand”. 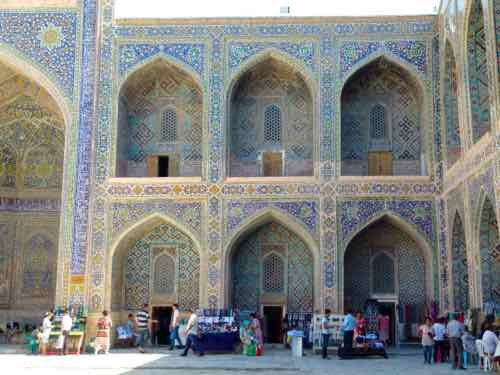 It was the center of ancient Samarkand. Those madrasas are gorgeous inside as well as from the front. Take a look at the Sher Dor Madrasa. But there are many other mosques, madrasas, and mausoleums. Timur is buried in the Gur-e-Amir. 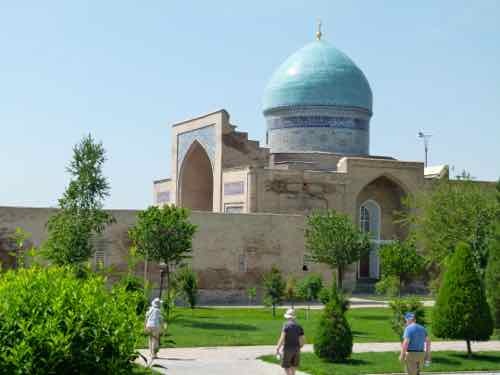 Wives and relatives are buried in elaborate buildings nearby in the Shah-i-Zinda mausoleum complex. And you don't want to miss Ulug Bek's advanced-for-its-time observatory. 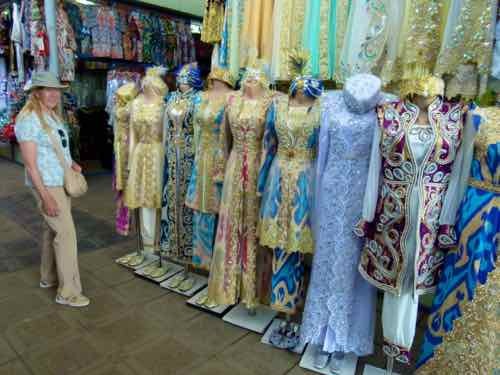 I got a really beautiful silk blouse in Samarkand, but you might want to save the shopping for Bukhara. 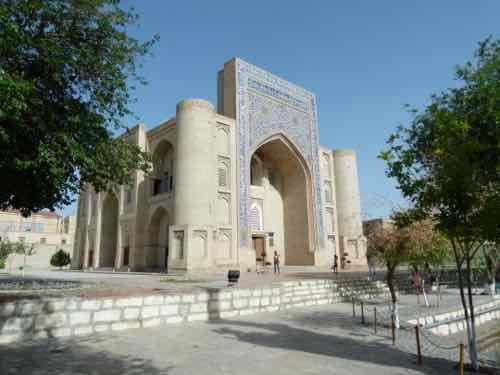 If Samarkand is the star of the show… I think Bukhara will win your heart. It has plenty of blue and turquoise tiled and mosaic buildings…. But the old town is still pretty much intact with bazaars and little alleyways that you can wander in. 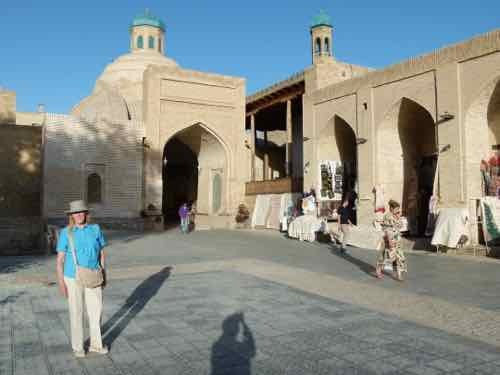 Perhaps because of its compact size, this is really a place to shop for carpets and kilims, ceramics and handicrafts of all kinds. 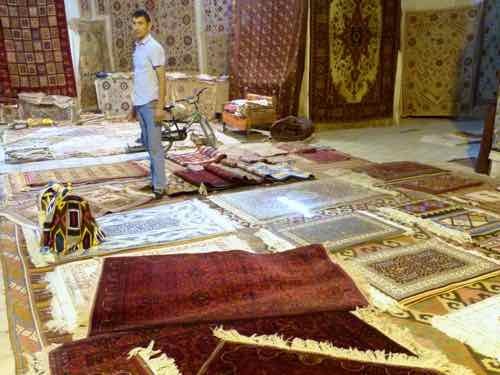 Yes, we bought a carpet in Bukhara…. it was not an impulse buy… we planned for it. And you need to do that if you want to buy one. Also you need cash. US dollars. There is only one ATM in town… and if you want to use credit cards, you can, but it will cost you way more. There is a big old fort on the edge of the old town, and an ornate summer palace just outside of town, but it is that old part of town that is the prize…. and the people. 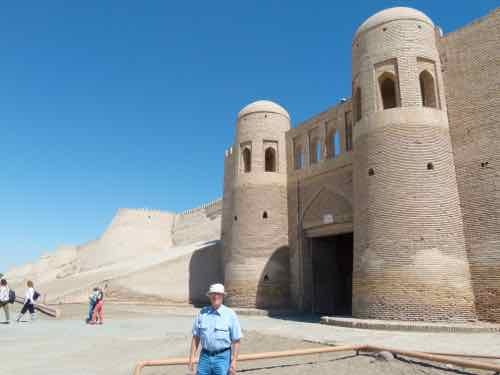 Khiva is great because the old city walls are still nearly intact…. 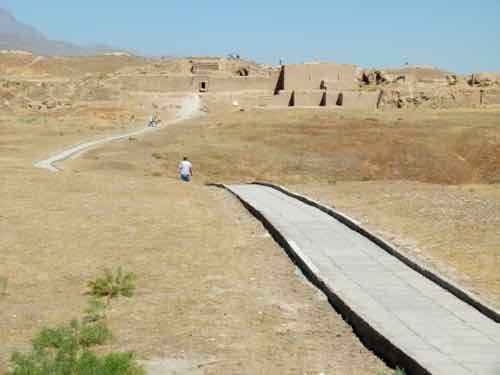 it is one of the best preserved cities on the Silk Road. 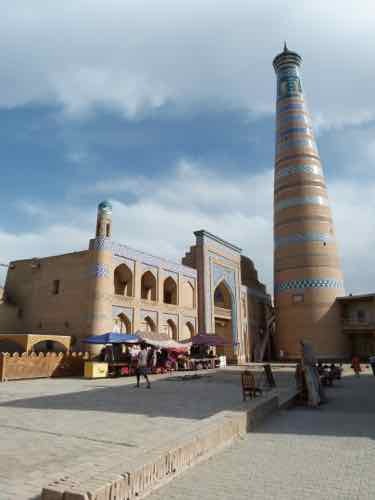 There are traces of human habitation around Khiva dating from the 5th century BC. 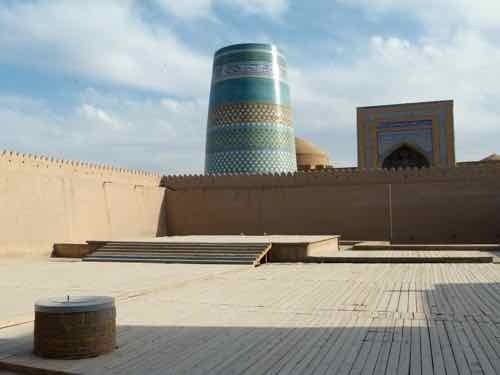 There is one legend that says that Khiva was founded at the place where Shem, son of Noah, discovered water in the desert… and the well is there, whether the legend is true or not. There are plenty of blue tile mosques and palaces, Two minarets dominate the little city. The Kalta Minor Minaret was unfinished when the Khan who requisitioned it dropped dead. The Islam-Khodja Minaret is newer… and taller. 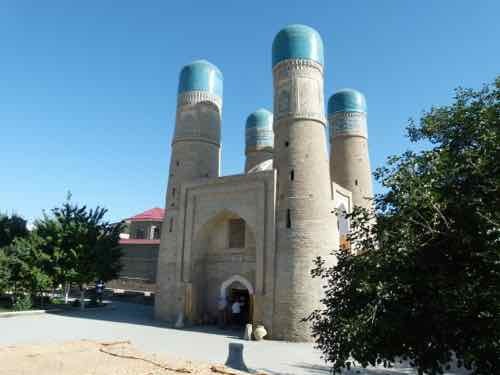 Both are landmarks in Khiva. It's a great little town to wander and get lost in. Living inside of the city walls is almost like living in a museum. There are great finds like this bread maker. 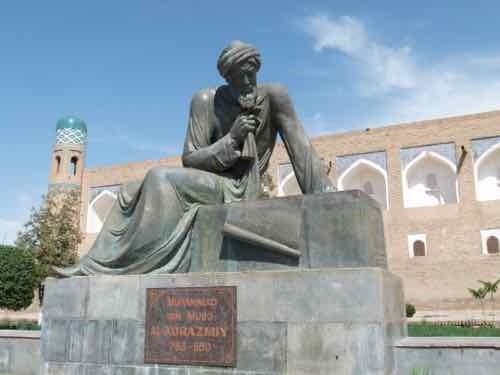 And on the more academic side… outside of one gate is a Statue of Muhammad ibn Musa al-Khwarizmi. In Latin that is Algoritmi. He was a mathematician who lived from 780 to 850. He introduced decimal positional numbering. Algorithm stems from the Latin form of his name, and he is often said to be the father of algebra. 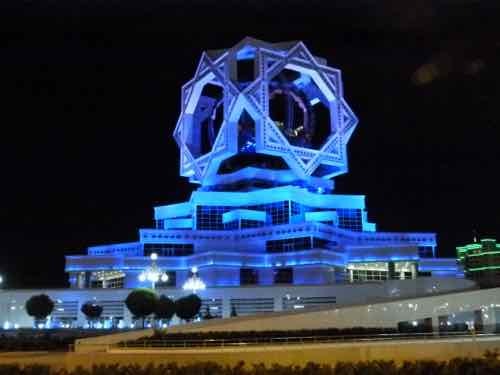 Ashgabat is the capital here…. and it is a different kind of city. 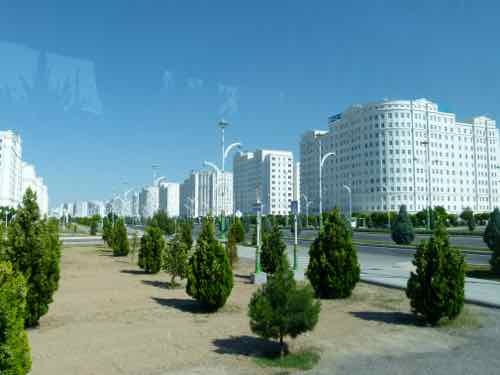 Ashgabat seems to be interesting for what it is not as well as what it is. It is not an historic city. It is new, and planned…. with mostly white marble-clad buildings. In fact it is in the Guinness Book of World Records for the city with the most white marble-clad buildings in the world… as we were told repeatedly. It's a little sterile and weird, since many of them are empty. And the ones that are in use are.... well, a little unusual. Like a marble-clad, air-conditioned Ferris wheel, and a wedding palace that puts on a light show at night... along with the rest of the city. 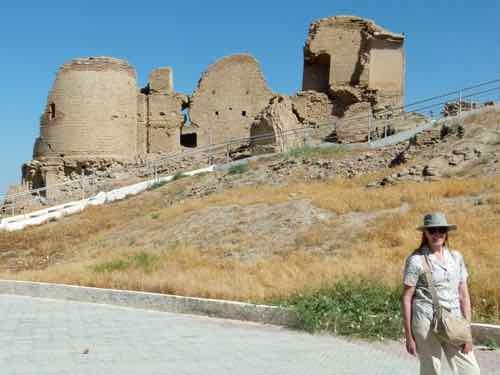 There are Silk Road sites nearby... For history, you have to go about an hour outside of the city where you can explore archeological ruins of the Parthian Kingdom of Nisa. And beyond Nisa, we found a horse breeder. 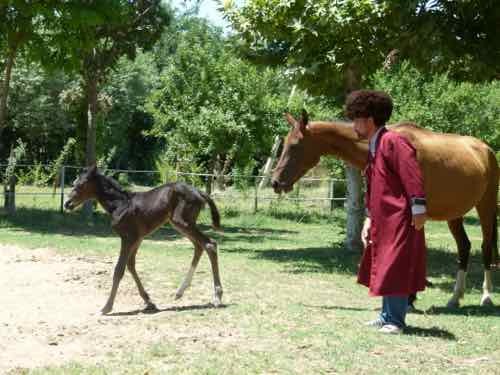 Horses are important to Turkmen too. They are proud of what they call the oldest cultured breed of horse in the world… the Akhal-Teke horse is at least thought to be one of the oldest existing horse breeds. About an hour in the opposite direction was the ancient city of Anau. In the 15th century it was known for its mosque. Today all that is left is ruins of the mosque. 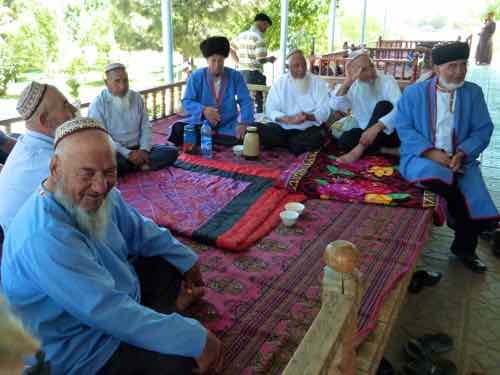 There is a community center where we visited with some elders. People to people encounters help bring everything to life. 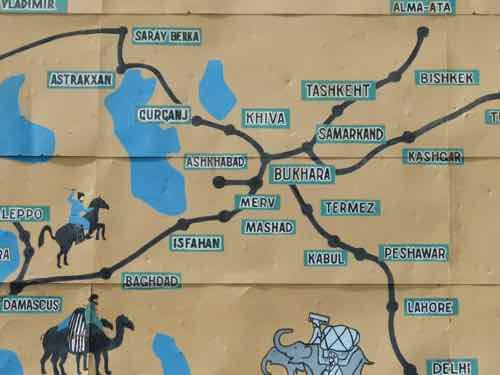 Planning independent travel in the Silk Road could be daunting. Three of the Stans require visas. It was helpful to have a tour that could help with the information you need for this. 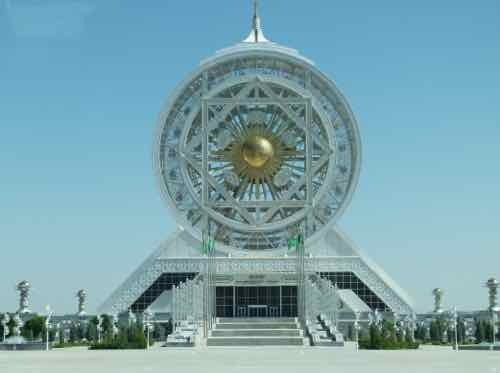 Turkmenistan requires a letter of invitation before you can get a visa. I want to mention this only because you really don’t need anything special. I packed a headscarf because I expected to need one when we visited mosques. I didn’t need it. The population in these countries is predominately Muslim, but the society in general is secular. The biggest consideration is the weather. It is very cold in winter and hot in summer. Tours generally do not visit at those times of year. In spring and fall, it depends on how close you are to summer or winter. We went in May, and it was pretty warm. Mark bought me a travel guide on the Silk Road a couple of years ago because we had talked about going. After we read the book, we both said, wow… lots of desert there; a few towers and mosques; lots of work getting around…. maybe it wouldn’t be so much fun. Well, it would be lots of work, and there probably would be lots of frustration trying it on your own, but with a tour, it was fun, and there was so much to see and learn. As I said, there are many companies that can help you. We went with Road Scholar. That company offered a good itinerary, a reasonable price, and lots of educational information. And now Marco Polo has nothing on us…. we’ve been on the Silk Road.